WASHINGTON — Carving the turkey is one of the most important— though sometimes daunting — Thanksgiving dinner tasks. 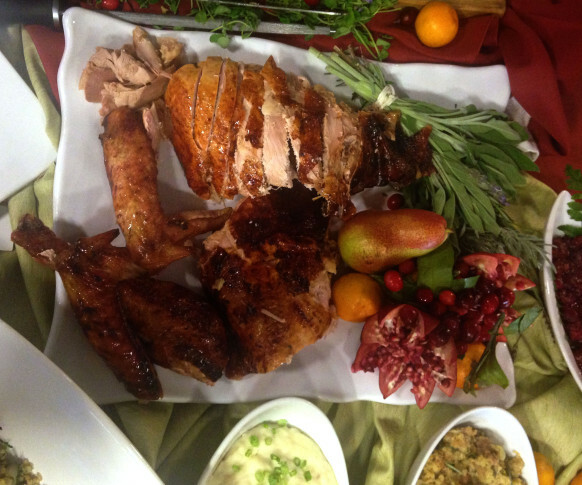 Luckily, Brian Baer with Amphora Catering in Herndon, Virginia gives us a first-hand look at how to properly carve a turkey and salvage all of its goodness. Baer says it’s quite simple, if you know a few tricks of the trade. Carve one side of the turkey completely before moving to the other side. Make a slit along the breastbone, guiding the knife against the bone from head to tail. Slice all the way down and peel away the breast. Bend the leg bone up, turn slightly and slice between the joint. Slice around the wing, keeping it intact, pull the wing off. To brown the skin, Baer rubs down the turkey with a compound butter that includes rosemary, garlic, thyme and whole butter. Baer also prefers to cook roasted sweet potatoes instead of marshmallow sweet potatoes. Canned cranberry sauce? Nope. Amphora’s homemade cranberry sauce is made with blanched cranberries, oranges and sugar. His favorite vegan and vegetarian options for Thanksgiving are acorn squash and tempeh that is basted in rosemary and thyme. Amphora Catering will also be offering two types of stuffing this year: apple sausage and chestnut. Friday is the last day for Amphora’s early-bird special.